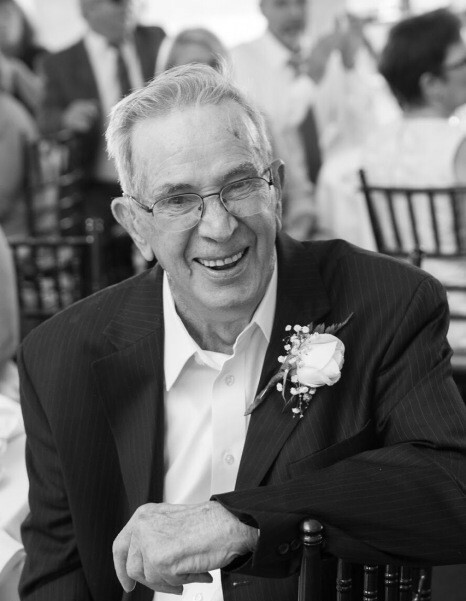 Manuel Calvao, Jr., 94 of Hudson, Ma, passed away peacefully on Monday, January 14, 2019, at Marlborough Hospital, surrounded by his family, after a period of declining health. He is reunited in heaven with his beloved wife of over sixty years, Irene (Ferreira) Calvao, who predeceased him in 2003. Manuel was born on March 6, 1924, in Milford, Ma and shortly after moved back to Chaves, Portugal, where he spent his early childhood. He moved back to Hudson in early grade school and has resided there for over eighty years. Manuel worked as a cement finisher and was the sole proprietor of M & M Construction Co.
Manuel was a longtime member of Saint Michael Parish and the Hudson Portuguese Club, where he at one time played semi-pro soccer. He was always part of a bowling team throughout his entire life and later became an avid golfer and member of Twin Springs Country Club in Bolton; his proudest day as a golfer came at the age of 92, when he hit his first and only hole in one on the fifth hole at Twin Springs. Manuel will most be remembered as a happy go lucky, generous man with a giant heart. Manuel is survived by 3 children, Clifford P. Calvao and his wife Susan A. of Northborough, Steven Calvao and his wife Janeen of Hudson and Lisa M. Joyce and her husband Robert of Hudson; 2 sisters, Dina Souza and Olga Batista; 6 grandchildren, Christina Calvao Medeiros, Maria Almada, Kimberly Calvao, Carssia Barker, Joseph Calvao and Patrick Joyce; 6 great-grandchildren, Edward Ferrecchia, Wyatt Calvao Medeiros, Walker Calvao Medeiros, Chadwick Calvao Medeiros, Matthew Barker and Emerson Calvao and many nieces and nephews. In addition to Irene (Ferreira) Calvao, his wife, and his parents, he was also predeceased by his daughter, Cynthia A. Almada and his brother, Armando Calvao. Calling hours will be held from 5 pm until 8 pm, on Thursday, January 17, 2019 at TIGHE HAMILTON REGIONAL FUNERAL HOME, 50 Central St. Hudson, MA. A Mass of Christian Burial will be celebrated at 9 am on Friday, January 18, 2019, at Saint Michael Parish, 21 Manning St., Hudson, MA; followed by interment in Saint Michael Cemetery in Hudson. In lieu of flowers, gifts may be made to VNA Care Network in memory of Manuel Calvao to support patient care at VNA Care, Fund Development, 199 Rosewood Drive, Suite 180, Danvers, MA 01923 or via www.vnacare.org.